The Editors of the Journal of Population Economics are also editing the Springer book series in “Population Economics”. Researchers working on human resources issues are invited to send book proposals to the publisher at Springer, Martina Nolte-Bohres (Martina.Nolte-Bohres@springer.com). The Global Labor Organization (GLO) supports the Journal of Population Economics. Research on population economics deals with some of the most pertinent issues of our time and, as such, is of interest to academics and policymakers alike. Like the Journal of Population Economics, the book series “Population Economics” addresses a wide range of theoretical and empirical topics related to all areas of the economics of population, household, and human resources. Books in the series comprise work that closely examines special topics related to population economics, incorporating the most recent developments in the field and the latest research methodologies. Micro-level investigations include topics related to individual, household or family behavior, such as migration, aging, household formation, marriage, divorce, fertility choices, labor supply, health, and risky behavior. Macro-level inquiries examine topics such as economic growth with exogenous or endogenous population evolution, population policy, savings and pensions, social security, housing, and healthcare. 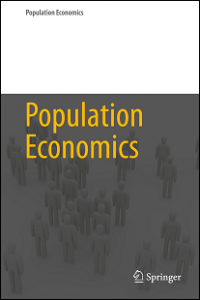 These and other topics related to the relationship between population dynamics and public choice, economic approaches to human biology, and the impact of population on income and wealth distributions have important individual, social, and institutional consequences, and their scientific examination informs both economic theory and public policy.